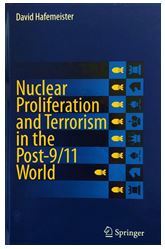 FAS Visiting Scientist, Dr. David Hafemeister, has just released his new book, Nuclear Proliferation and Terrorism in the Post-9/11 World (Springer 2016), a unique textbook tailored for undergraduate courses on nuclear proliferation and nuclear weapon issues and policy. The text fills a clear gap in the current literature surrounding these issue areas — utilizing a concept-led approach that encompasses a broad audience, the author moves beyond pure policy issues, addressing topics such as offensive and defensive missile systems, command and control, verification, weapon effects, and nuclear testing. A chronology of nuclear arms is also presented, including detailed discussion of the Cold War, proliferation, and arms control treaties. While the book is intended for upper division students taking courses on nuclear proliferation, the general reader will also find it to be an engaging introduction to the science and strategy behind modern era international nuclear policy. “I’ve used some form of this book for 43 years and it was time to write it all down,” Hafemeister said. Read a synopsis of the book, plus an exclusive interview with the author here. Allison Feldman is the Communications and Community Outreach Officer at FAS.